SemPress is a highly semantic, HTML5 template, responsive and seo optimized. The theme supports most of the new HTML5 tags, the new HTML5 input-types, microformats, microformats v2 and microdata (Schema.org). SemPress is fully HTML5 compatible and uses a lot of the new tags, semantics and input-types. Thank you, very nice theme theme. Is it based on the Twenty Twelve theme? Is there support for featured images? I find schema.org support a strong feature. Have you considered adding a ‚custom post type‘ that would enable entry of Schema.org : Reviews ? the Theme is built upon the Toolbox-Theme but I made a lot of changes to it (added a bunch of semantics for example). Frage: Gibt es irgendwo eine Übersicht, wie die Post-Types und Inhalte, wie blockquote und co aussehen? Ich hab hier mal ne Demo installiert: http://sempress.rs.af.cm aber in den nächsten Wochen sollte ne neue Version online gehen. Danke 🙂 und ich schau mal ob ich das optional mache… Vielleicht ein extra „Responsive CSS“ welches man deaktivieren kann. I have a question, in your website (as well as in the image in this post) there’s an image on the left side of each blog post. It seems an icon associated with the category… how can I implement that? Thank you, Very great theme! Top Theme! 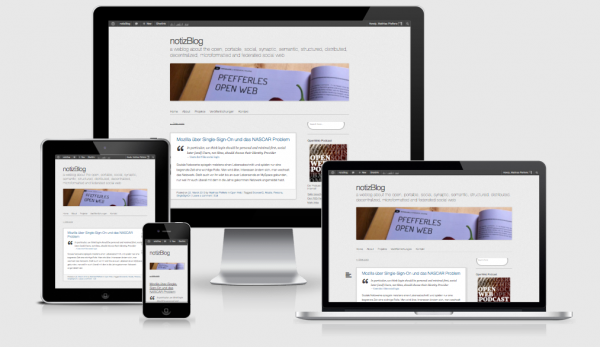 Für meine Zwecke fast perfekt und deutlich vor den kostenpflichtigen wordpress.com Themes. Mir fehlt als Nichtzahler nur die Möglichkeit, ein Header-Bild, wie bei Dir hier, oberhalb der Navigation zu platzieren. Kein Problem. Danke für die Hintergrundinfo! Hi, great theme, I am using it for my company’s blog. but you may want to review this to be sure it works as you expect. Thanks for the feedback, but with the sidebar on the landscape mode it doesn’t fit at the old (not retina) ipads. Perhaps there is a way to check if it is a retina or not??? Hello, I just wanted to say Vielen Dank! This is a gorgeous template! The only problem I’m having is when I try to use a custom sidebar for one specific page. For my old theme I used the loop to determine if it was a specific page and then a would insert the different sidebar for the one page but that isn’t working now. I see in widgets you can have two sidebars but I don’t one on top of the other, I want one or the other. How do I now call I custom sidebar (not the default) for only one page? As I understand you right… Do you want a custom sidebar for single posts/pages? Also another question (sorry), how can I specify a page to use the full width (no sidebar)? Hmmm, that’s not that easy… Do you have an example for a theme that does support that? If you want a page without sidebar, you have to choose the „Full-width, no sidebar“ template. Thank you for the wonderful theme. I was able to apply to my current blog and it’s beautiful, especially the smooth responsive to different devices. Also, the clean and simple catch design is another awesome! I want a feature image to align center. And I translated theme to Korean. It’s not good, but I think it will be useful to Korean users. Is there a problem with jetpack infinite scroll in the latest version of github? I found this problem related with Quick-Cache plugin. When I turned it off, infinite scroll works fine. Thanks. I really like your theme. I am using it on WordPress.com. I note that you (and WordPress) say the theme supports featured images, yet I cannot implement this (I’ve added featured images to each of the pages, but the one image shows up on all pages). I’ve done a bit of Googling, and can’t find any examples of SemPress sites (either on WordPress.com or self-hosted) that have different header images on different pages. I also lodged a support request with WordPress.com, and they have concluded that the themes doesn’t support featured images. @scottjenson thanks, I will take a look. I am trying to answer a question for myself why WordPress themes are using hentry or h-entry on pages, as pages are not ‚datestamped content‘. Actually, in the ‚live-examples‘ on this page: http://microformats.org/wiki/h-entry I also see that it is mostly use for datestamped content like blogposts or comments. For pages Google webmaster tools is going to give errors because it’s looking for ‚author‘ and ‚updated‘ which is not present on pages. I also see you use ‚h-as-page‘, I could not find any docs on microformats website about this. Can you point me in the right directions what this h-as-page is about? I like the sophisticated simplicity of this theme. It gives me all of the features I need to put my content front and center without visual distraction. Very nice work. Thank you. Love it! i’ve to try this one 😉 does it has any updates?